E M Delafield’s Provincial Lady is one of my favourite literary characters. I remember the first time I read the original Diary of a Provincial Lady. I picked it up at work, in the first library I worked in 20 years ago. A friend at work recommended it, I took it home, started reading in bed that night & was instantly in fits of laughter. I then bought the lovely Virago edition with all four PL books in it – The Diary, The PL Goes Further, The PL in America & The PL in Wartime. The Diary was originally published in weekly instalments in the feminist periodical, Time & Tide. The diary-like jottings, short staccato sentences, flights of fancy & memos to Self are just so funny. The difference between life as the PL imagines it will be & life as it really is produces some of the funniest scenes in the book. The PL (we never know her name) is a wife & mother, living in an English village between the wars. Her husband, Robert, is less than supportive; her children, Vicky & Robin, are whirlwinds of energy & devastatingly honest; Mamselle, the French governess is overly emotional but tries to be helpful & Cook & the housemaids are terrifying & often threatening to leave. Then there’s the awful Lady Boxe & Our Vicar’s Wife, who never knows when to leave. The whole flavour of the book conjures up that between the wars period of the servant problem, Brief Encounter, writing to the bank manager about the overdraft & making do with last year’s clothes. Humour & self-deprecation are the keynote. 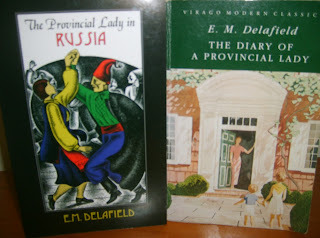 I’ve just read a book by E M Delafield which has been published under various titles. Straw Without Bricks, I Visit The Soviets &, most recently, The PL In Russia. This isn’t really a PL book. It’s not in the same style & format as the other PL books. The main character is never anyone other than E M Delafield herself., but it probably sells better with Provincial Lady in the title. Published in 1937, it’s the story of Delafield’s visit to the USSR. Initially, her publisher asks her to go & write a “funny” book about Russia. She’s doubtful about her ability to make a trip to Russia funny but her publisher is convinced that she’s the only person for the job & she sets off. It is a funny book but not funny in the way the PL books are. There’s naturally very little of the domestic detail that I love in the PL books. It’s humourous travel journalism. So, we read about the two inseparable English spinsters, the over-enthusiastic American woman, the earnest Swedish expert, the voluble Frenchman etc. There’s also the bad (or occasionally good) food, fleas in the beds, inadequate bathrooms & the horrors of train travel. Delafield’s strength is in her observations. The travellers are never just caricatures. She makes them real, not just a jumble of national characteristics. The Savoyard who is indignant at not being able to change his leftover Russian money back into francs at the end of his trip, makes a huge fuss, but turns out to have only about two pounds anyway. The earnest American student who hasn’t realised that he can’t take undeveloped film out of the USSR, goes through long explanations & discussions with Customs but finally has to leave 12 photos of the Crimea behind. The irony of the telling of this story is delicious. Delafield’s view of the USSR is an interested one. She is impressed by the efficiency of the new regime, the schools, hospitals, communes & factories. But, she is aware of what was lost, especially during a poignant visit to the Imperial family’s former home at Tsarskoe Selo, where she looks at photographs of the royal family & reflects on their fate. She also grows tired of the sanitised view of life in the Soviet Union which is all she gets from the guides who carefully shepherd the tourists to all the approved sights & reply to questions with a few stock phrases. She’s very aware that she is only seeing the approved view for Western visitors. Although it’s only 20 years after the Revolution, she’s aware that there’s a less rosy side of life. Mention is made of political prisoners & the penalties for disobeying the regimentation of the lives of ordinary people. If you’ve read all the PL books & still want more Delafield, I’d recommend this. Good old Delafield. Have you read any non PL ones? Verity, I've also read Thank Heaven Fasting (another VMC), Late & Soon & Consequences (Persephone). Consequences was the most strikingly different in tone & subject matter. Quite distressing in fact, about a young girl who isn't going to be a social success & the ostracism she suffers from her family & social circle. Simon, it read to me as though it was written as pieces for a magazine. The first section on the farm read quite oddly & was followed by the beginning of the trip. I thought the farm stay should have come later. It seemed a bit jumbled up, like the several titles it's had over the years. It's a bit misleading to call the Russian book by the PL title. I assumed it was more of the same. I've only read TPL and loved it. I'm a little afraid to read the others as I'm afraid they won't be as good. As for the Russian book--it still sounds interesting even if maybe a little disjointed. I am your new blog follower and this series sounds delightful; the time period, the main character and the humor. The PL is very funny but do start with the first book, it's the very best of the series.